In a world where competition is vital, it appears the smartphone market has two clear competitors with iOS and Android fighting for the dominant crown, with the other manufacturers purely spectators. In a new report coming from the IDC, it confirms that the smartphone market continues to see iOS and Android thrive and the fight for third place really the only one up for grabs at this point. Between iOS and Android, the two operating systems accounted for a total of 92.3% of all smartphone shipments during the first quarter of 2013. In an even more impressive stat, Android-based smartphones shipments last quarter increased by 79.5%, with Apple seeing a 6% increase, which saw Apple’s share of the smartphone market slip from 23% to 17.3%. While Apple posted a strong increase in sales of their iPhone, representing its largest volume of shipments for the first quarter of a year, their overall market share decreased. The decline in share but increase in products shipped is solely down to the success Android is seeing in the smartphone market. With some strong figures, pure saturation of the market is helping reduce Apple’s once strong hold on share. Samsung alone accounted for 41.4% of Q1 2013’s smartphone shipments, representing 54.6% of all Android-based smartphones shipped during this period. While the battle for first and second is really only between two contenders, it is Windows Phone that is beating Blackberry for third. Microsoft’s mobile operating system saw a 133 percent increase in shipment volume, hitting around 7 million units, in the first quarter of 2013, compared to that of Blackberry who saw a 6.3% decline in shipments. These stats really do not sound good for Blackberry who are experiencing continuous decline in their smartphone sales, but it appears Windows Phone are winning the battle for third. 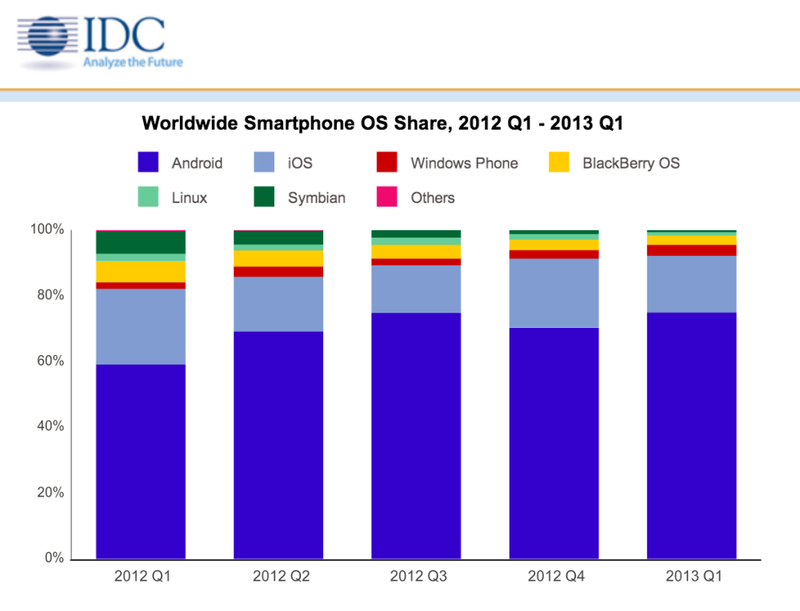 Android continue to saturate the market, whilst Apple still report steady sales but decline in share. It seems this is the trend we will continue to see. Is this a surprise to you? Let us know in the comments section below.